I printed out what I proposed as the “final” lettering artwork on the transparency film. I included four alignment marks for the corners. I laid the panel down on newspaper and sprayed the panel with “Elmer’s Multi-Purpose Spray Adhesive” – I got it from Home Depot a year or so ago for another project. I moved the panel to on top of a magazine that had not been sprayed, and carefully positioned the transparency film over it. The fact that the film is transparent helped a lot…this would be difficult with an opaque film. I was worried about bubbles or smudges in the adhesive, and they do indeed exist. They don’t look as visible as I worried about, though. They provide a bit of texture, even. The film is pulling up at the edges…since this was more of an alignment test than a finished piece, I didn’t really work hard to press the film into the panel. Also, I used a pair of scissors to trim the edges, and that pulled the film up…an X-Acto, bearing against the panel edge, would have avoided this problem. I X-Acto’d through all the holes, bearing the blade against the metalwork to form scissors. The only problem points were the countersunk holes. For a homebrew project, I probably would not countersink. Or, if I did, I’d have those screws in place before the film was attached, and just glue the film right over them. The flathead screws, when they went in, wrinkled up the film around them. I think I’ll try the technique for my next homebrew project. It certainly serves for what I needed to demonstrate this time. A very nice looking front panel, Dave! I’m going to have to give this a shot. I’m a lousy mechanical engineer, but I think even I could pull this off respectably. 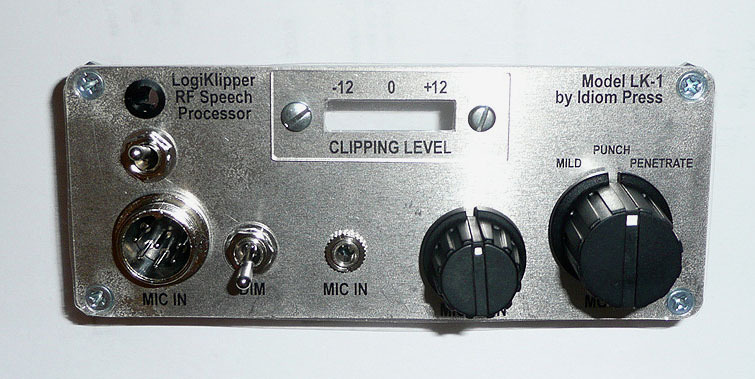 I’m curious as to what features/functionality of LogKlipper will make it superior to the “other southern” product? Off the top of my head I would say ease of configuration, better dynamic range, a great built-in noise gate, and near-immunity to RFI. I’m currently in the process of using the competitor product in my shack. Getting it to work with my Icom was a huge pain, and the manufacturer did not have the correct information on how to set it up. Once I got that figured out, it does function basically as advertised, but the clipping level bargraph is essentially worthless as far as I can tell. I have had a bit of time testing the LogiKlipper through an audio mixer, but to be fair I haven’t got my hands on a prototype for the shack yet. However, based on what I’ve seen of the design, my time playing with it, and my discussions with W8NF, I’m confident that it is a better product.